Baltazár is a family owned boutique design hotel located in the heart of the historic city center, the World Heritage Buda Castle district. The neighborhood of our small luxury hotel is also a key Gastronomic Quarter of Budapest, with unique and celebrated restaurants. 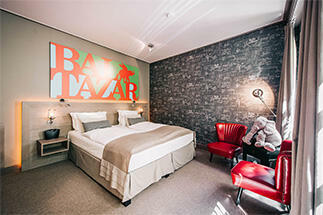 In the stylish guestrooms no detail is overlooked; the eclectic nature of the public spaces at Baltazár is carried on into all 11 rooms and suites. 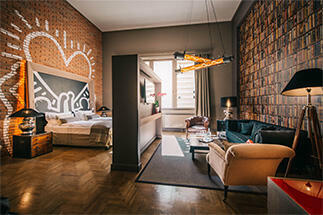 Each luxury room has its own bohemian spirit featuring an innovative mix of color, texture, artwork, and graphic design. The guestrooms all come appointed with original vintage and modern furnishings and handcrafted local limestone bathrooms, complemented by tailor-made amenities and technology. The unique and cozy design, friendly staff, central location, and excellent service make Baltazár the Best Small Hotel in Hungary (TripAdvisor). The hotel also houses Baltazár Grill, a restaurant starring a charcoal grill that is favored by locals for its serious meats and extensive selection of regional wines. The Wine Bar is focused on top quality and authentic wines of Central Europe and also showcasing the best gins of the World. Baltazár is a gathering place for connoisseurs to enjoy dining, drinking, and socializing. Our team has prepared a Hotel Info Card for details about our services to make your stay with us even more comfortable. Regarding your stay with us please read our House Rules. Please also visit Pest-Buda Hotel as part of the Zsidai Gastronomy & Hospitality Group's boutique hotel collection, just a few steps away from Baltazár. Individually themed rooms, wall colors, wallpapers, and artwork featuring designs and inspirations by Vivienne Westwood, Keith Haring, Andy Warhol, and Jean-Michel Basquiat. Furnished with original vintage furniture and iconic pieces. King size beds with the finest linens and real down duvet covers and pillows that can be swapped for anti-allergic versions. Bathrooms with handcrafted local limestone and rain shower by Hans Grohe, bathrobe on request. Exclusive in-room cosmetics by L'Occitane. Individual heating and air-conditioning. LED TVs with a wide range of international channels. Music player connecting to your smartphone. Easy-to-use smart lighting system that you can adjust to your mood. In-room safe, hair dryer, and luggage rack for your disposal. Baltazár is located in the historic downtown of Budapest, the World Heritage Buda Castle district, in a relaxed area surrounded by protected landmark buildings, famous monuments, and museums. You are encouraged to enjoy the charming yet peaceful streets and breathtaking panoramic views of the city. 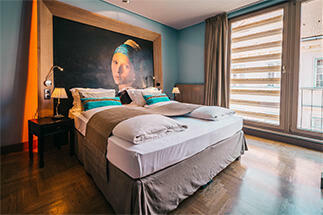 Individually designed and themed rooms with lots of natural light, king size or twin bed. Bedrooms are decorated with selected original vintage and modern furniture, features views of the bright courtyard and the district's church and rooftops (depending on the floor). Perfect for singles, young couples, or business travelers. 2 croissants, 2 types of jam and butter, 0,2l freshly squeezed orange juice, 1 hot drink, and a bottle of filtered water. A classical á la carte bistro breakfast is also available at Baltazár Grill. Individually designed double height luxurious Loft Suite. Enjoy the comfort of an exclusive living experience in a spacious living room with king size bed and a separate second bedroom. The room of your dreams with oversized window and bright view is decorated with selected original vintage and modern furniture. 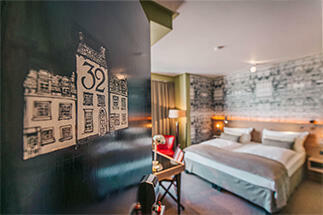 Individually designed and themed room with selected original vintage and modern furniture. Spacious room, window facing the courtyard garden. This room is suitable for guests without need for a view. Perfect for singles or young couples.